On Saturday mornings, I pause in the quiet of the morning, sip on some hot coffee, and just let my thoughts flow onto the page. Want to join me in this joyous ritual? Link up in the comments, and feel free to save and re-post the above logo! 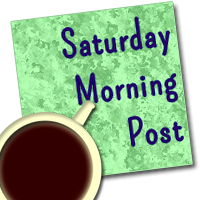 Check out my fancy new Saturday Morning Post logo, courtesy of Mr. Wonderful. Happy Saturday, y'all. Go shop at a Small Business today, because it's Small Business Saturday. As a girl who had food on the table growing up, everything she needed for school and activities like cheerleading, and a college education ALL because of her mom's hard work and successful small business, I urge you to do this. We're going to. I wish we shopped at more small businesses. But, sadly, it's hard. Especially in a big metro area like DC to even find stuff at small businesses. Not to mention buying American. Another thing I want to do, but find it difficult. And I'm not even saying because of the prices, but because the stuff is so hard to find. What have we done to our great country? Okay. Starting to sound political. So, stopping now. There's a Christmas tree in a box over across the room from me. And two plastic tubs full of ornaments. And four new boxes of lights. I say, just buy new lights every year. They're like $2.50. So worth not having the headache. Yesterday, we went to Ikea. As I mentioned above, I'm a horrible shopper who doesn't follow her convictions: It's cheap stuff made in China, sold in a huge big box store owned by Europeans. Ahem. Anyway. I got some cool bottles and jars and I hope to fill them with homemade goodness for our family members this Christmas. We're so lucky, because we are both going to see our immediate families around Christmas this year. Last year, we mailed like 12 Priority Mail boxes. So, we're majorly looking forward to seeing our people. We had to miss my family's Thanksgiving, which was a bummer because that's actually my FAVORITE holiday, and my brother-in-law and my sister always make a beautiful, bountiful feast. But, I was still sick, Michael woke up Thursday morning feeling sick, and at that point we knew it was contagious, so we didn't want to spread it. Not the kind of dessert we wanted to bring, you know? Also, believe it or not - this is the first time Michael has gotten a cold since we got married! He has like the Fort Knox of immune systems. I guess that's what having your hands on dirty, nasty, germy wheelchair wheels will do for you. I hope he continues to get better and better. It hasn't been that bad yet. I definitely had it worse. It got in my chest, and that's what worried me about spreading it to Michael, because, I've been coughing with all I have and he can't really cough all that great, so I may or may not have worried him into the Emergency Room. Phew. Why do I do that? So, yeah. We had a little Thanksgiving at home. Watched the Macy's Thanksgiving Day Parade. I made a turkey breast and all the fixin's, which we have been eating for the past couple of days. And we'll be eating Pumpkin Gingerbread Trifle and Pumpkin Chocolate Chip Muffins and Cranberry Scones until March. But, it's all good. Okay, there you go. Your Saturday Morning Post. M's still sleeping. B's not barking. So, onto my coffee, my devotions, and.... Pinterest. So sorry to hear you both got sick! Been there, done that. You made a wise choice to stay home and not "spread the cheer." Hope you're both feeling better by now.